I’m a huge fan of train travel, and I never miss an opportunity to check out railroad museums during my travels. So, when I was planning a trip to Scranton, I knew that I needed to visit Steamtown National Historic Site. 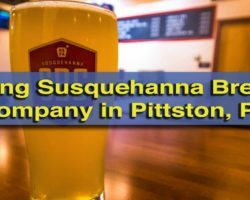 The story of the site started in the mid-1800s, when several iron executives came together to find a way to haul their products to larger markets with the creation of the Delaware, Lackawanna, and Western Railroad. Of course, it wasn’t just iron that was hauled on the lines, but coal from the region’s many coal mines and passengers looking to make the trip along the rail lines that went through Scranton, north to Buffalo, New York, and east to Hoboken, New Jersey. However, by the 1920s, the use of coal started to decrease, and with it, the railroad company began a slow decline, until it merged with a long-time rival in the 1960s, and eventually was bought by Conrail in 1976. The Scranton rail yard, which had been in use since the 1860s, was completely shut down in 1980, though it had been in a state of disrepair for many years prior. A steam locomotive sits inside Steamtown’s Roundhouse. The highlight of any visit to Steamtown National Historic Site is the restored Roundhouse. It was here that trains were brought for minor repairs during the early part of the 19th century, and today, it is used to both service and store trains. Inside, you can walk on an elevated path that takes you past many awesome locomotives. At each train, there is a bit of information about the history of the piece and why it is important to railroading. Not all of the engines here run on steam. 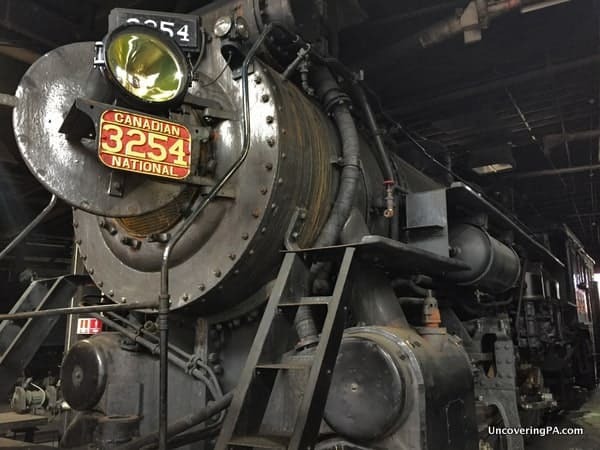 According to Park Ranger Ken Ganz, it is impossible to tell the story of steam train travel without talking about what replaced it: diesel locomotives. Because of this, many of the pieces on display at the museum are early diesel engines. In addition to the Roundhouse, Steamtown National Historic Site has two main exhibition areas. 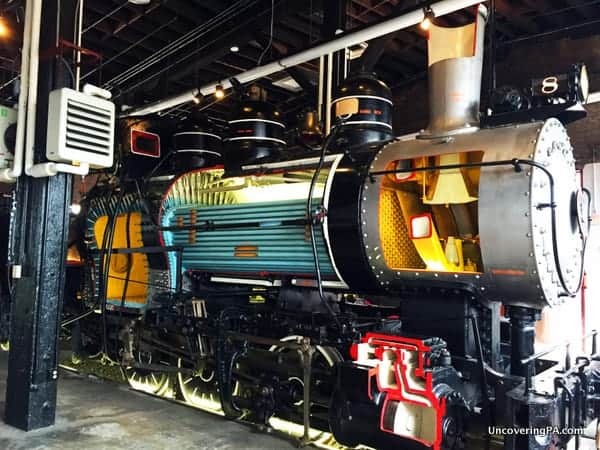 The exhibition spaces at Steamtown National Historic Site talk about the history and technology of railroading. The first is a history museum, that teaches about the history of train travel in America. While many of the exhibits here feature artifacts and signage, there are also several interactive exhibits. The first is an area for kids that allows them to dig through rocks on an archeological dig to find items similar to those found during excavations of the roundhouse in the 1980s. There are several well-restored train cars that show what freight technology was like. 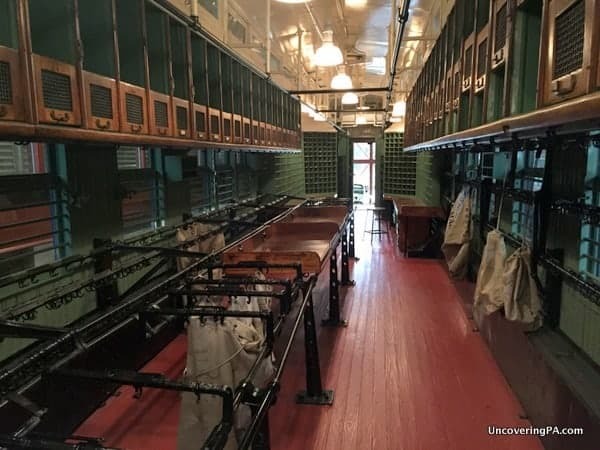 I was especially fascinated by the very well-restored mail car, which gave me a great appreciation and understanding for how mail was carried throughout the country in the early 20th century. The mail car at Steamtown has been incredibly well restored. Lastly, there is also a very interesting area where they have multiple mock train stations. As you walk into the room, various parts of the room light up and give you an idea of what sounds you would have heard at train stations 100 years ago. I found it quite interesting to hear the difference between a rural station and an urban station. The other exhibition area focuses on the technology of train travel. One especially interesting exhibit is an authentic steam engine that’s had its frame cut away. Inside the parts of the engine are color coded to help visitors understand how the engine worked. The cutout on this engine shows how a steam locomotive works. The rest of the technology museum contains many fascinating exhibits on how signals prevented wrecks, how the rail yard worked, and even a very large diesel engine. Before leaving, make sure to visit the second floor for a fascinating miniature model of the rail yard as it would have looked in 1937. This functioning model is complete with moving train cars, and does a great job of showing how the yard worked. Another interesting area of the site is the Locomotive Shop Tour. While off-limits for independent exploration, the shop is open for guided tours a few times every day. 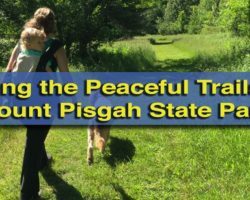 These tours are included in the ticket price and are a fascinating way to learn about the restoration work that is ongoing at the site. Make sure to ask at the ticket counter when the next tour begins. 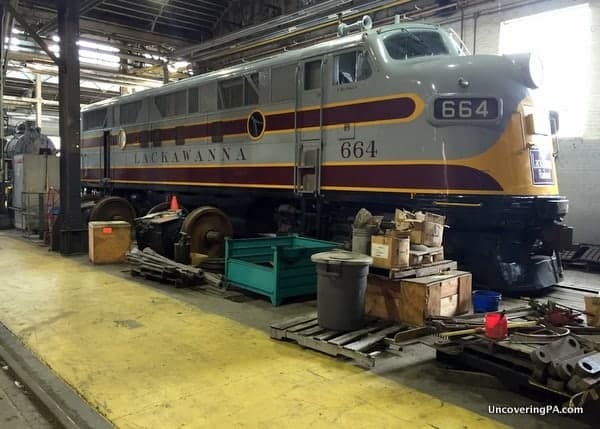 A Lackawanna diesel locomotive sits inside the Engine Shop at Steamtown. During your time at Steamtown, make sure you don’t miss the Union Pacific Big Boy engine, which is located outside the museum along the train tracks. This engine is one of the largest ever produced, and, of the eight remaining in the world, this is the only one east of the Mississippi River. From these tracks, Steamtown also offers train excursions on select days from April through December (with trains leaving every day in July and August). Unfortunately, my visit was on a day when trains were not running, so I was unable to experience the excursions. However, were I to visit again, I would make sure to check out the museum on a day they were offering them. 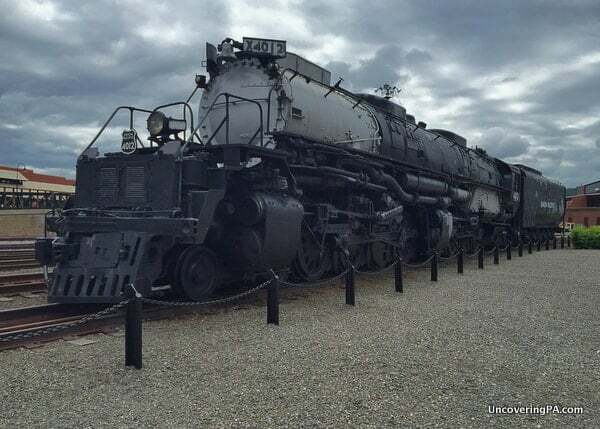 The Union Pacific Big Boy at Steamtown is one of the most unique pieces in their collection. I did find it interesting that they don’t currently have a steam locomotive to pull the excursion trains, given their focus on steam engines, but am told they are in the process of restoring several and hope to have steam locomotives back soon. In addition to the short excursions offered regularly, Steamtown also offers special train trips several times as month. 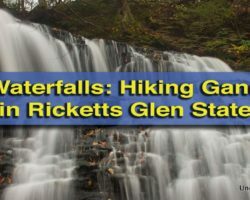 These trips can last anywhere from a couple of hours to all day, and go as far as the Delaware Water Gap. Full information on the excursions offered can be found on their website. 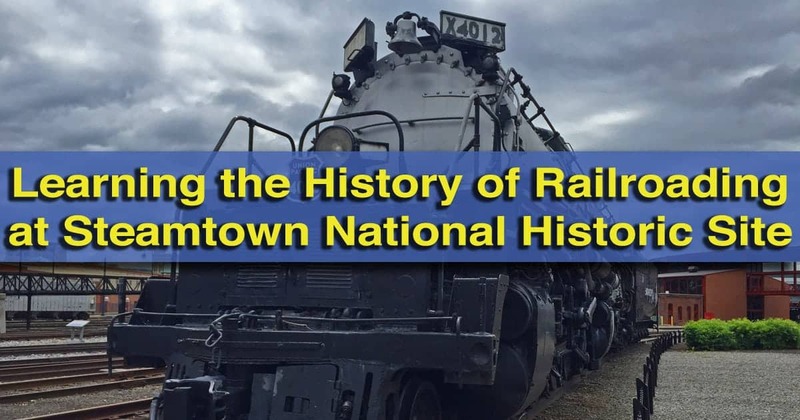 Overall, the exhibits at the Steamtown National Historic Site are very interesting, and I doubt there is a better destination in Pennsylvania for those wanting to learn more about steam engines and railroading history in general. I can’t wait to visit again to go on one of their excursions and to see more of their excellently preserved collection. Either before or after visiting Steamtown, head across the parking lot to the Electric City Trolley Museum. This museum covers the history of street car transportation in the area and offers rides on vintage trolleys. Scranton’s former passenger rail station is now a Radisson hotel. Tip: Want to see even more of Scranton’s railroading past? 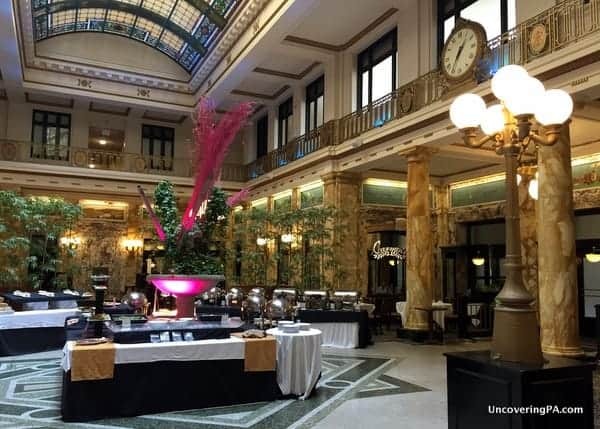 Check out the former passenger train station, which is now the Radisson Lackawanna Station Hotel (affiliate link). The lobby and exterior of this hotel have been wonderfully restored to showcase the beauty of this building. Note: My visit to Steamtown National Historic Site was hosted by the museum. However, the opinions expressed are my own. 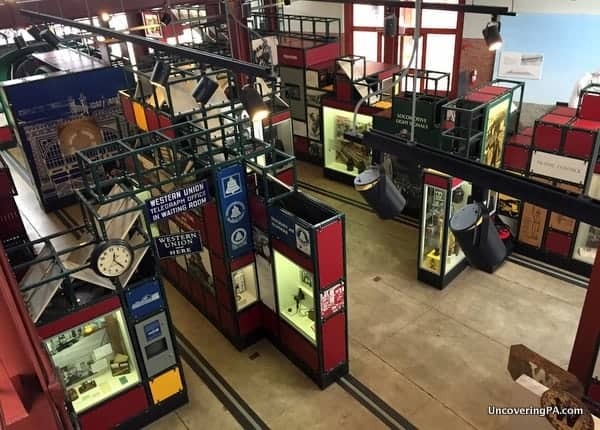 Uncover even more of PA’s railroading history at the Railroad Museum of Pennsylvania, the Railroaders Memorial Museum, and the Lake Shore Railway Museum.